Was your car vandalized on Halloween? Halloween is the most dangerous day of the year for parked cars. HDLI's analysis also confirms some other interesting vandalism myths. 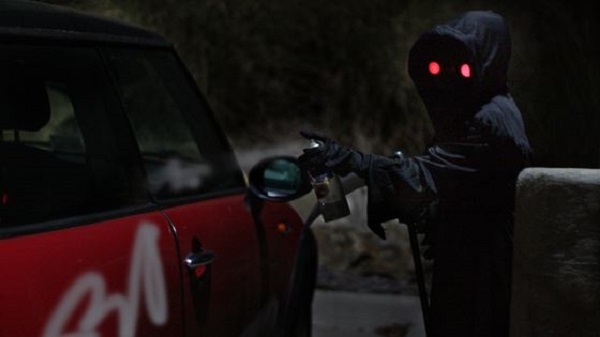 Did a Jawa spray paint your MINI this Halloween? Or maybe a mini grim reaper slashed the tires of your Smart Car. If so, you are not alone. According to the Highway Loss Data Institute (HDLI) Halloween is the most likely holiday of the year for your car to be vandalized. Can you guess what day is the second most likely day for your car to be vandalized (not counting the day that your home team loses a playoff series – more on that below)? If you guessed the Fourth of July you are correct. Anyone with any street sense knows that unless you like washing egg off of your car it is best to put it away on Halloween. Nevertheless, on a slow day the folks at HDLI took a break from trying to figure out which kills more Americans, texting or Bee stings, and decided to look at the average daily claims during holidays. The myth that your car is likely to be attacked by short people in costumes on October 31st has been officially confirmed. The group wasn’t looking into small scale attacks like a fun size snickers being smeared on the hood vaguely in the shape of a dirty word either. Nope, these were slashed tires (figure just under the deductible for that zinger) and smashed windshields. That would be my preference by far, since in Mass. our glass is oddly free when broken. What better way to rid one’s self of annoying cracks and pits from salt and sand? The HDLI analysis discovered that car vandals like holidays. We understand the link between “trick” or treat. And it is not too difficult to get the tie in with alcohol and vandalism on say New Year’s Eve (number 3 on the list) and St. Patrick’s Day (fourth). However, did you know that Christmas and Thanksgiving are only slightly less than average vandalism days? That’s just not nice. The HDLI study also confirmed that vandals, like all crooks, are lazy. They don’t do much vandalizing when it is cold. The three top months for vandalism are, in order, July, August, then June. Saturday is of course the most likely day for a vandal to get the gumption to assault your Civic. Sunday is next, but we suppose that is a technicality since late Saturday nights turn into very early Sunday mornings. Have you ever wondered how much vandalism costs Americans on an average day? On a typical day the cost is a cool $ 1 million. However, on bonus days like Halloween it about triples. The average cost of a claim is about $ 1528. Sounds to us like the cost of four nice Michelins mounted and balanced. If it is news to you that cars get vandalized on Halloween we would also like to inform you that parking out in front of any sports stadium during the final game of the playoffs is also not a wise move. Even typically laid back Canadians can act like hosers when their team loses a playoff game, as the Vancouver residents discovered when the Bruins, led by “little ball of hate” Brad Marchand took their Stanley Cup a couple years back. Turning over a few cars was not enough to satisfy the frustrations of those fans, so they then went to the church that power forward Milan Lucic worships at – and of course vandalized that too. That they did this seven months after the 4-0 loss is simply procrastination.